Review: Absolute damage: Spooky finally unleashes two of his biggest summer dubs. 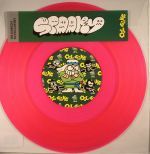 And he's doing it in pure pink vinyl style. Fiesta slaps with a well-known sample before hopping onto the gulliest skank of his life. The groove says party, but the bass says murderation. Flip for an even fruitier piece of funk as Eric Donaldson's reggae classic gets the murking it never knew it needed. Make no mistakes: Spooky is donning it right now. Review: Deep grime instrumentals; few labels are doing it like Oil Gang. The clue's in the title - the tight-knit London crew are dealing strictly in sinister, seeping, dark, slick sounds. This one's even darker than usual as Spooky drops the aggro and goes straight in with the deep dagger dynamics. All stealth-like and creepy, "Low Rider" isn't a track you want on your headphones walking home through the wrong postcode at night. 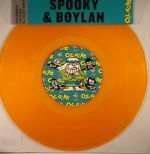 Boylan ups the energy with a stampier twist the rhythm and a dramatic riff croaking from the humanized bass tones. Badness.